Offical artwork of Starfy from The Legendary Starfy. Starfy (スタフィー, Starfy), previously known as "Stafy" in Super Smash Bros. Brawl and other media before the localization, is the main character of the The Legendary Starfy series. The first three games in the series appeared on the Game Boy Advance, and the latest two on the Nintendo DS. His trademark move is his Star Spin attack. His most recent game, The Legendary Starfy for the Nintendo DS, is the first game in the series to be released outside of Japan. 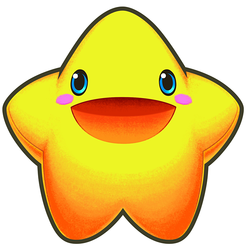 Starfy in Densetsu no Starfy (Legendary Starfy or Legend of Starfy). Starfy is the prince of the Pufftop Kingdom, which is found high in the sky above the ocean. His adventures involve resolving a crisis in his kingdom, or another kingdom (in the last two Legendary Starfy games) with help from his friends Moe the clam, Old Man Lobber the lobster and his younger sister Starly, among others. When Starfy appears in Super Smash Bros. as an Assist Trophy, a short melody will be heard. This melody plays in the first four Legendary Starfy games for when Starfy or Starly faces a boss as part of the tune Confrontation with the Boss. The Starfy Assist Trophy attacks using the neutral form of his Star Spin (known as the Spin Attack in Japan). This is Starfy and Starly's most basic attack in the Legendary Starfy games that was originally taught to Starfy by Herman in Densetsu no Starfy and is described as Starfy's famous move in The Legendary Starfy, though Starfy often forgets it. In the Legendary Starfy games it can be upgraded two times, to the Mighty Star Spin (Spin Attack level 2 in Japan), and then the Ultra Star Spin (Spin Attack level 3 in Japan). Starfy attacking Diddy Kong in Super Smash Bros. Brawl. Starfy appears as an Assist Trophy in Super Smash Bros. Brawl. A fanfare plays upon appearing before he starts performing his spin attack, which can briefly trap an opponent, somewhat like Toon Link's Spin Attack. However, Starfy's spin attacks are very weak, and similar to Lakitu, Starfy can be attacked and knocked away. If he receives a high amount of damage, however, he will explode, which gives high knockback and damage, which can act as a deterrent of sorts to prevent combatants from attacking him. If Starfy is somehow knocked away, he can stun opposing players upon descending for about two seconds and deal a large amount of damage, leaving said players open for attack from the summoner. Additionally, Starfy appears as a regular trophy, which is unlocked by clearing Target Smash!! Level 1 with at least 10 different characters. In Brawl, his name is spelled "Stafy", as Brawl was released before the first Starfy game was released outside of Japan, which gave him his localized name. Starfy in Super Smash Bros. 4. Starfy re-appears in Super Smash Bros. 4 as an Assist Trophy, functionally identically as he did in Brawl. Starfy was shown in a screenshot without immediate confirmation of his Assist Trophy role, was later confirmed as such in E3 2014 demo footage. Starfy has a regular trophy in Super Smash Bros. 4. Starfy trophy in for 3DS. Starfy trophy in for Wii U.
Starfy is Pufftop Kingdom's scatterbrained prince and the hero of the Legendary Starfy. He looks like a star, or maybe a starfish - no one knows what he really is. When released, he'll boldly attack enemies with his Star Spin. It's not a very powerful attack, but at least he's trying! Starfy makes a return as an Assist Trophy and acts similarly to how he did in Super Smash Bros. Brawl and Super Smash Bros. 4. Official artwork of Starfy from Brawl. Starfy as an Assist Trophy in Ultimate. In Brawl, the trophy of Starfy's sister Starly (named "Stapy" in Brawl) is indexed under the "Fighter Related" category, despite the fact that Starfy is not a playable character in the game. Furthermore, no Custom Robo, Kururin or Animal Crossing trophies appear in the "Fighter Related" category, although Starfy, Ray Mk III, Helirin and Mr. Resetti all appear as Assist Trophies. This page was last edited on March 9, 2019, at 19:24.